Our most economical Surface Mount (SMT) test socket is a clam-shell design which is contact populated with pogo pins. The customer can choose the socket material and the pogo pin type, including probe tip preference. For production SMT testing, we recommend the TOOLTRONICS Micropress Test Fixture. The Micropress is a durable and precise fixture that will house the PERSONALITY MODULE (Contact Plate, Device Nest and Pressure Pad). The PERSONALITY MODULE is device-specific, so Micropresses can be re-purposed with a PERSONALITY MODULE change. From our experience most test engineers have specific socket feature requirements, so most of our socket designs are custom. Starting with the socket material, the customer can choose from several engineering plastics, including some that are ESD compliant. Socket size and socket mounting hole locations can be specified by the customer, as well. Next, the customer can choose how the socket will be contact populated. For a typical high current application, the input and output power pin locations would be populated with the 'HPK' series kelvin contacts and the signal pin locations populated with the lower current 'LPK' series kelvin contacts. 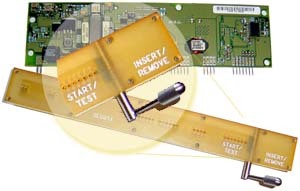 Optional special features include Device Guides, Finger Clearance, Probe Window and Device Ejection. HPK kelvin series: These low insertion force contacts are rated at 50A and are ideal for the high current positions in a typical test socket. These contacts are available for the following module pin diameters: .040", .062", .080", .150" and .180"
HPK-FS series: These contacts are rated at 50A and were designed for use in our kelvin ZERO INSERTION FORCE (ZIF) sockets. 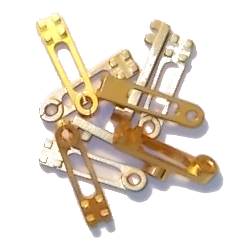 To compensate for the lack of wiping action in a ZIF socket, the face of these contacts is serrated for an improved electrical connection. These contacts are available for the following module pin diameters: .025", .040", .062" and .080"
HPK-PCB series: PCB mountable high current contacts are used in burn-in and test applications. These contacts are available for the following module pin diameters: .031", .040", .062", .080", .150" and .180"
MPS series: High current solid pin non-kelvin contacts are used in vibration sockets and other applications where kelvin is not a requirement. 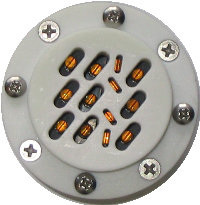 These contacts are available for the following module pin diameters: .031", .040", .062", .080" and .094". In 1995 we made the decision to begin designing and manufacturing custom test sockets for the power electronics and aerospace relay industries. One of the main components, needed, was Kelvin pins. Initially, we planned to purchase them from one of the established suppliers, but after much research were unable to find a suitable candidate. Precise orientation of the Kelvin pin is required when used in a relay socket for hook pins, which are often rotated 30°. Contacting square or rectangular pins also requires precise orientation. High current is often required for power electronics test sockets. To be able to retain the Kelvin pin’s vertical location, without the use of epoxy or other adhesives. 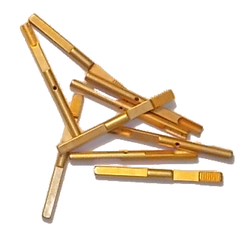 ​Our only option was to design and manufacture the Kelvin pins we needed. For higher current we selected 0.015” thick Beryllium Copper, rather than the 0.012” thickness that most Kelvin pin suppliers offered. For precise orientation and vertical retention we designed an obround (rectangular, with a full radius at each end) shaped plastic injection molded insulator, rather than the typical round insulator found on other Kelvin pins. ​The P/N LPK-100 Kelvin pins can be placed on 0.100” centers in a SIP application. 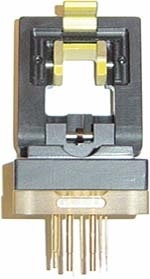 The P/N LPK-125 Kelvin pins can be placed on 0.150” centers in a SIP application. Both are available for sale, or installed in custom designed test sockets. In his free time, Joe enjoys golf and motorcycle riding.